Hey babes! I hope y'alls week has been going well! Lately, I've been really trying to get to know the city I'm in! It's crazy how many different little areas there are that you never noticed before. Scouting for pictures has helped me to open my eyes to new possibilities. It's been really fun! I bought these printed pants a couple of months ago and I can't believe I'm just getting around to wearing them in an outfit photo! I love the subtle contrast the baroque print gives to a normal pair of black skinnies! P.S! The lovely ladies at Sense & Sequins featured me as one of the bloggers they love! Check out my interview and their amaze blog here!!! This is a super cute outfit - those pants are excellent. I love the baroque print too, and they look great with those shoes. As usual, you look fab! Love the outfit, and your blog looks great! CHeck out the details on those pants. Lovely. Love those pants rolled up. And the socks almost make the heels look like booties. It is beautiful detailing right there. Impressed! I really love your outfit, I am so obsessed with stripes! great outfit ! love the top! and shoes!! Those pants are really cool, and I'm loving your bag! Those pants are so fun! I love them with the stripes! Isn't it funny how taking outfit photos opens your eyes to all the pretty area in your own city?! Great outfit! Love the print mixing! Subtle but fun! I love these pants. I have a pair of pants that have a design like that and they are so fun. Spices up a regular pair of black pants! Hey love! Love your blog :) You are too cute! Love the design of your blog too :) Great post here by the way too! Super fun and loved the pants. Hope you come stop by my blog sometime! Maybe enter my GIVEAWAY I'm hosting right now!! Super cool and edgy look! So chic, and I love those shoes! Love this look, the pants are so pretty and they look great with those shoes ! Enter my statement turquoise necklace Giveaway , open worldwide until May 7th ! So glad I found your blog through your comment. These pants are adorable and I love the socks with the heels! so cute! i love youre hair! Great photos! I think you found a great location. Love the outfit. Your jeans are brilliant but my favourite part is the socks and heels! LOVE! Love the pants and the shoes!! So awesome! Let me know if you want to follow each other. We can have some fun together!! Beautiful!! I love the socks with your heels! Such a nice outfit! I love your pumps ;I think it's great to add socks because it keeps you warm but also brings you to an another level of fashion! Thanks for stopping by my blog, love yours also! Glad to have discovered it now! Please enter to my Giveaway where you can win hair products from AUSSIE! Super cute outfit, and I loved the interview! I know this situation that your eyes opens during you look constantly for locations for photo shootings ;) I now recognize things which I never ever saw before in my life! 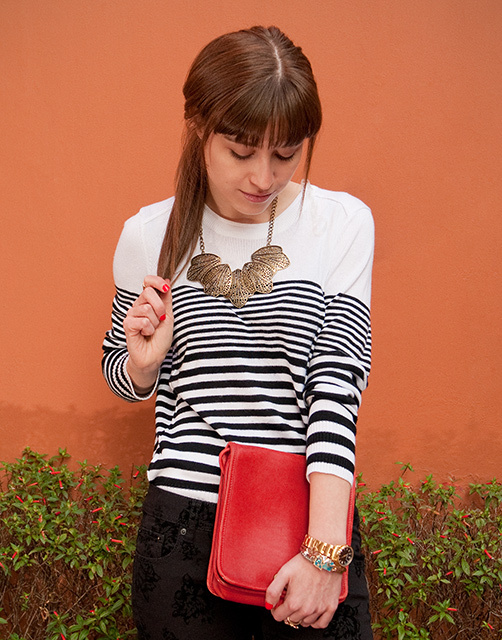 Love this necklace SOO much...especially with the stripes! Super cute!!! Really love the splash of colours against the monochrome.